Are you getting as weary as I am of this (rather endless) Presidential race, full of drama, blaming, shaming and its usual share of flip-flops? But the good news is that we can distract ourselves with beautiful, warm weather (finally)! You’re probably doing the very same thing. But a word of caution to those of you who wear flip flops (and doesn’t just about everyone?) They can be pretty bad for your feet. Dr. Jackie Sutera, a Vionic Innovation Lab expert and American Podiatric Medical Association spokesperson, doesn’t say not to wear them; but instead suggests that you wear flip flops in moderation. These flat shoes are best suited for a day at beach or pool, not when you’re going to be out walking or doing errands, she says. “Flat shoes cause the feet to spread and collapse, stretching out the tissues (a common cause of the painful condition, plantar fasciitis),” she explains. Why are traditional flip flops so bad? 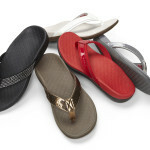 You can win a pair of their Tide II Toe Post Sandals (valued at $64.95). All you need to do is leave a comment. Tell us why you need these Vionic flip-flops. Pick any reason, no matter how silly it may sound, and we’ll pick one winner at random. The rules are much more simple than figuring out who to vote for come November: Comments must be received by 9 AM ET, Friday, June 3. If your name is chosen, you’ll get an email requesting your address; if you don’t reply within 24 hours, another lucky winner will be chosen. Your loss; their gain. Thanks for reading – and good luck! These are so cute! I have a condition called pelvic congestion and it causes my back to hurt so bad when I stand or walk too long. I wore my cute pink flip flops yesterday and it is clear today they are not supportive enough. I think wearing them in moderation is good advice. Sorry about your back, Doreen, and hope you find relief (and the right shoes!) soon. Yes, cleaning out your closet or even getting a pap smear might be better than watching the political news today! I like to wear shoes with a bit more support than the regular flip flop. These are very cute sandals. So true. I wore a pair of flat cheap flip-flops (circa 1970s) last year for a day and my feet felt worn out. These look fabulous. Thanks. Oh, I so need these. Living in San Diego, I used to wear flip flops all the time but they don’t give me enough support any more. I would LOVE these! That will be so nice to walk around my town in those cute flips flops. I’ll have done a special pedicure to show them off! Ooh, a special pedicure would look especially lovely in those cute flip flops! With my flat feet these flip flops seem like they would provide cushion! Sounds like they’d be the perfect fit for you, Judy! Ouch, bunion surgeries are tough, I hear. Hope your feet are good to go now! I bet my dogs would quit barking if I had these sandals! They look yummy and plush. I don’t have much of an arch in my feet and they tend to feel tired and sore . This was a nice piece, by the way. Loved your headline. ( And I am burnt out on childish politics and the reporting of it). I’ve never seen these flip flops. Would love to try them. If I don’t win, clue me in on where to find them. I love wearing flip flops all summer!! Hi, I have been a long-time wearer of flip flops (need to take dog out, oh just slip into flip flops and the walk always turns out longer than I expect). I think this goes back to wearing them at the beach or on vacation, so I get a feeling of being free and relaxed the way I feel at the beach, which is my happy place. There’s an emotional connection that includes the flip flops! Your article made me think about why I wear them so much, and I realize that I am hurting the soles of my feet and often have a back ache from them. Thanks for the helpful info, and I do love the look of those shoes? I too would like to know where I can get them if I’m not a winner! Flip-flops are an essential part of my travel wardrobe. They are great on cruise ships, at pools, and to give your feet a rest of more enclosed shoes. These look so cute! Came across this posting looking for help for plantar fasciitis. Who knew my flip flops might be hindering my healing. Thanks for sharing.